Emissivity factor value can be from 0 to 1. In case of infrared thermometers which do not allow for adjusting this parameter manually, it is usually stored in internal memory of the device and it has a constant value of 0.95. It is suitable for most commonly examined materials. A problem occurs in case of materials with a very smooth surface, such as polished metals, emissivity factor value of which is below 0.1. Use insulation tapes specially designed for infrared thermometers; their emissivity factor is known. They can be put on the object under test. The insulation tape quickly absorbs the temperature of the object and its emissivity corresponds to the factor stored in internal memory of the infrared thermometer. 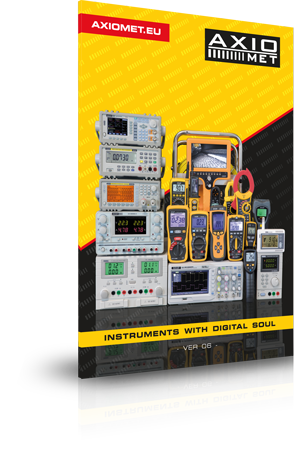 Determine errors of measurement on your own for different temperatures, within the range important for the user. When you compare readings from the infrared thermometer with readings from the tactile thermometer, you can further calculate measurements taken with the use of the infrared thermometer to obtain more credible values. Both these methods can be used in case of surfaces with unknown emissivity factor.